Hello everyone, welcome. Today I wanted to talk about another piece of software I use when planning roleplay games. I have previously talked about Scrivener which I still rate highly in terms of having a database, however I started playing around with Inspiration 9 and found a number of elements to it useful, and quite intuitive. I should say I have been using Inspiration 9 for a while, though recently discovered the Browser based software, Scabard. I will do a future post on that so that people can compare. Inspiration 9 – What is it? 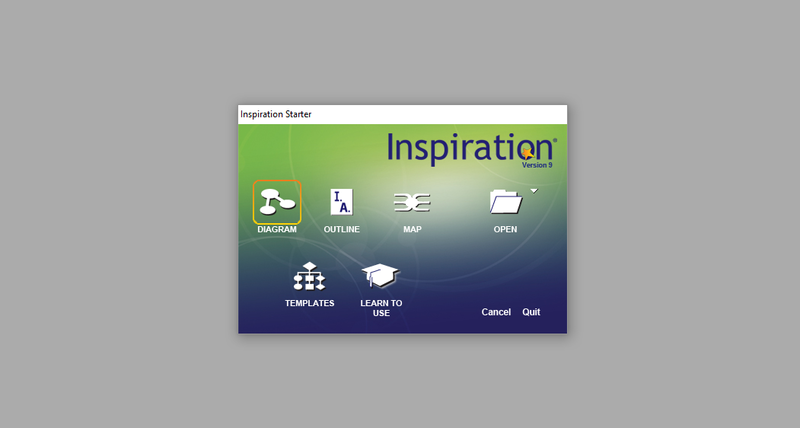 Inspiration 9 is a piece of mindmapping software. Basically, it is used for onscreen brainstorms. It has three Modes; diagram, outline and map. Diagram is your basic balloon to balloon flow diagram where you can draw out thought process and show relationships between. Outline mode is more like a list setup where you can easily designate hierarchies in the list, move entire sections about and add notes whilst diagram is a more visual thing used to demonstrate process. Whilst I have used diagrams in the past, Outline Mode is what I shall focus on here. I created a file and called it the Chronicle Starter Toolkit and this is what the expanded NPC part looks like. I will post a video showing it in action later. I can copy the Title NPC and that will copy all the subheadings as well, meaning I can paste the template into any part of an inspiration document. There are a number of subheadings (I sometimes add appearance as well, but it is missing from this example) each of which address part of the character. For instance I can put an image of the Character Sheet on the appropriate line so I can ascertain at a glance what the character’s stats are. The Bio, I use that section to write the character background and history. The Backgrounds section is more for World of Darkness games and is where I list the details of the character’s contacts, retainers, territory and where they get their money etc. If the character has any quirky character traits or abilities I include in the Quirky/Unique things, and Frequently used abilities is a sub menu I use to include screenshots or photos of rules for various abilities. This might be a DnD Spellbook, or a Vampire’s discipline list. Encounters of note, I use to note down any encounters with PCs or other NPCs that are worth remembering. Secrets are just that, and Liegeman is where other significant NPCs owe allegiance to this character. (Contacts on the Backgrounds menu don’t warrant much more than a name and a couple defining traits). The Location template works fairly similarly. In the Description subheading, I give an overview of the – what it looks like, feels like, how affluent and friendly it is etc. If I am playing a game that supports ratings on locations, then I use Background ratings section for that, Otherwise I would use to list population Estimate, defences, etc. Prominent individuals I usually break down into Mortals and Supernaturals (remember, World of Darkness Games), though it could be split into Nobility, Specific Guilds, Districts etc. For NPCs that have full character sheets, I will populate an NPC Template (shown above, and Demonstrated below) and paste it into the submenu. That way, that NPC is always included in anything to do with this location. If the location has sub locations worthy of mention, I note them in the Locations within Tab (If they are important enough I might take the location Template again and populate it for the sublocation – this is probably only worth it for towns or larger). Maps and Secrets, those should be self explanatory. Ok, so that is how I build and use templates. Now, let us say I am going to be running a game in the near future, how do I go about that? I know it is happening in an Area that I already have created and populated, so that is all well and good. I open a new Inspiration Outline and make a Gamesheet, like the one below. And that is it. Each of the events outlined above could be expanded to have mini events/details attached to them. You can note if these details are obvious or not if you like. Here is an example. Once you set up a template for a Location/Area, you can keep a copy separate from your campaign so you can easily reuse it/run one in a similar area. Once templates are established, it is pretty easy to gather required components together to make a scenario. If players wander off the main story and they are in an area you have already built a template for, chances are you have populated it with some NPCs and have a good idea of what the place is like so you should be able to roleplay something – even if it isn’t a problem to solve. Buy it once, use it as many times as you like. Visually, the Outline isn’t pretty. There is a cap on file size which is usually only an issue if you are using lots of images, but as a campaign progress it becomes a large file. The file could become unwieldly unless you have lots of separate files but that presents a clutter issue of its own. If you are using Inspiration to make a portable database of Spells/Powers, not only do you have the cap – it takes a long while to build. I am currently using Inspiration to Run several campaigns. After playing around with it, I find it quite straightforward to build a new location, npc or even a games night. And since I tend to recycle stuff a lot, it is easy to move NPCs from one campaign to another. Is it for everyone? Possibly not, but I like it and recommend.